About the Book: Carina and Her Care Partner Gramma, the second book in the Shaky Paws Grampa series, was written to address Parkinson's disease (PD) specifically and to provide a communication tool for people with Parkinson's to use with their children or grandchildren. This book provides details specific to PD symptoms and mentions important issues in the "PD world," including deep brain stimulation therapy, PD advocacy, the importance of exercise, the need for patient participation in clinical research studies, and the importance of care partners. 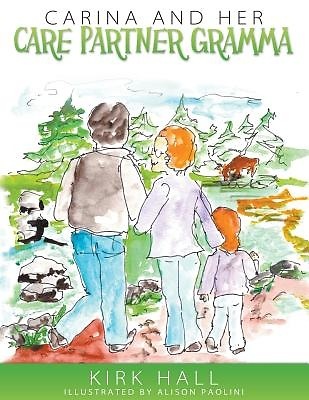 Carina and Her Care Partner Gramma was conceived and written by Kirk Hall and illustrated by Alison Paolini, PD patients who also are parents and grandparents. A portion of the proceeds from the sale of this book will be donated to support Parkinson's research and awareness. **** About the Author: Kirk Hall is a husband, father, and grandfather of six living in the Denver area. He has been an author and patient perspective Parkinson's advocate since 2011. His personal experience as a person with Parkinson's includes participation in three area support groups, clinical research studies including two visits to the National Institutes of Health's (NIH) National Institute of Neurological Disorders and Stroke (NINDS), and joint presentations with movement disorder specialists to support groups sponsored by the Parkinson Association of the Rockies (PAR) and University of Colorado Hospital. Kirk has been a guest speaker at the Muhammad Ali Parkinson Center in Phoenix and has been the subject of television, radio, and newspaper interviews. He and his wife of 43 years, Linda, are Parkinson Disease Foundation (PDF) clinical research advocates. Kirk's Shaky Paws Grampa blog, which includes articles about his writing, advocacy activities, PD-related subjects, and personal journey can be found at http: //shakypawsgrampa.blogspot.com/. **** About the Illustrator: Alison Paolini lives in Northern California where she enjoys a multitude of creative activities. She studied acting, set design, fine art, and commercial illustration at California State University at Northridge where she received her BA in Art. Alison is a published illustrator and poet. She is an active member of the Parkinson's Association of Northern California. She and her husband have two children and three grandchildren. They have enjoyed living in and visiting many parts of the world.